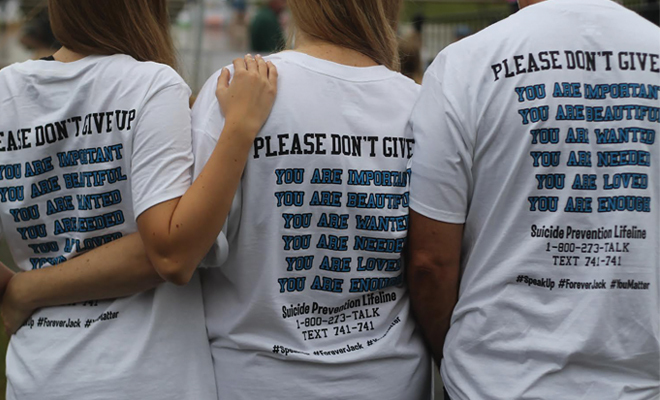 Suicide Prevention Education Awareness for Kids United as Partners, or SPEAK UP, is a not-for-profit charitable foundation created in 2015 by two families that both suffered the devastating loss of a child to suicide. Co-founder Allie Doss said, “After Sara passed, I wanted to change the world she struggled with. I wanted to show our youth that there was always another option. Sara was at war with herself. Everyone who loved and knew her become collateral damage that day. Some of our wounds will never heal. Every day I wake up hoping and praying that what I do with the foundation will save more lives in our community. It is our hope that SPEAK UP will provide education and awareness, bridging gaps among our community, schools and parents. We wish to encourage conversations with our children, provide parents information on how to identify warning signs and offer resources if you think your child is at risk. Most importantly, we want to end the stigma associated with mental illness and teach kids that it is okay to ask for help. “While parents and school leaders are part of the community to help our teens, it takes teen leaders to influence their peers if we are really going to be successful in removing the stigma of mental illness and preventing suicide. That is why SPEAK UP is focused on providing teen-led resources in our schools,” affirmed Jan Marrs, mother of Lane Marrs. Join us Sunday, September 16, 2018, at Garmin Pavilion, 1200 E. 151st Street, Olathe, for the third annual walk; registration at 8:00 a.m. with walk at 9:00 a.m. Funds raised will help educate local teens and their families about mental health through SPEAK UP. Register at www.speakup.us.